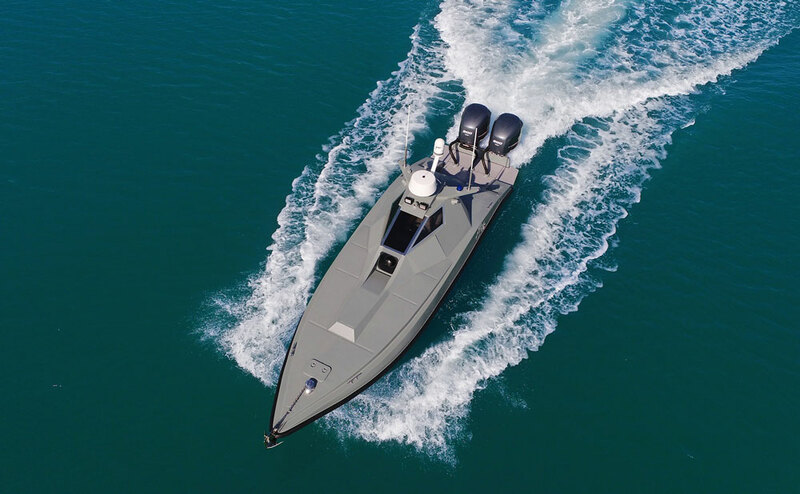 UAE boat manufacturing company Al Marakeb is displaying its armed 13 m Unmanned Surface Vehicle (USV) at NAVDEX 2019 from February 17-21 in Abu Dhabi. The AHM13USV is a byproduct of a recent collaboration with long standing Emirati boat builder Al Hareb Marine for visitors to experience maritime technology first hand. The shipping container on display at Al Marakeb’s stand hosts a Command and Control station, which operates the 13 m vessel situated at Ghantoot, 70 km away from the Abu Dhabi National Exhibition Centre (ADNEC) where NAVDEX is being held. The vessel is remotely controlled by the C2-20 Command & Control Station at NAVDEX using MAP Pro Autonomous Technology. For the live demonstration, the MAP Pro system relays engine diagnostics, route management, a live camera feed, radar screens and an obstacle warning alarm in real-time. However, most notably, the system showcases live operation of the STAMP gun that is mounted on the vessel, and is provided through an ongoing alliance with Turkey's IGG ASELSAN. The AHM11USV, a new 11 m addition to its fleet, is also making a debut at NAVDEX. The USV is comprised of the boat and propulsion system, the patented MAP Pro autonomous conversion kit and the MILAS rocket launcher by Aselsan. The LMM Missile Launching System (MILAS) developed for defence against surface and aerial threats; is a customised solution for different naval platforms such as fast interceptor craft, patrol boats and corvettes. In December, Al Marakeb launched the dual-use B7X USV, which can be used for both manned and unmanned operations and a wide range of missions, including vessel monitoring, law enforcement, automated commercial transportation, search & rescue and surveillance.